The use of glass in the landscape is something that has interested me for some time, and is something I hope to incorporate into one of my stone projects at some stage. It is buildings like these bottle houses below that make me want to try it out for myself. What an amazing place it is. And as with all inspiring places lies a compelling story of a innovative mind with a creative dream. The Bottle Houses are located at Cap-Egmont, Prince Edward Island, on the gorgeous east coast of Canada. 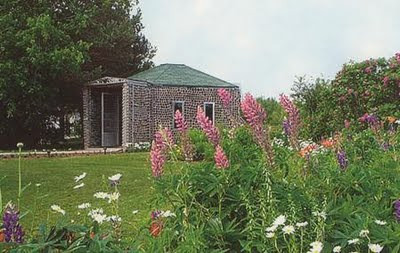 They were built by the late Édouard T. Arsenault. 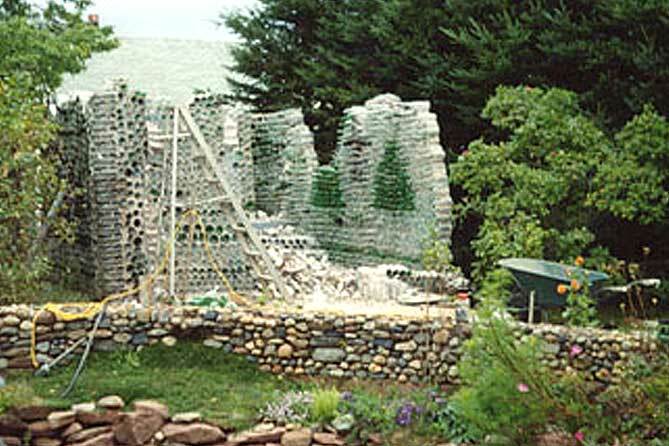 In 1979 Édouard received a postcard from his daughter of a glass bottle castle she had visited on Vancouver Island in British Columbia, he was so captivated by it, that he was instantly inspired to make his own glass bottle creation. That same summer, he started collecting bottles from his community, from a local restaurant, community dance halls, friends, relatives and neighbours. He spent the winter in the basement of his home, cleaning bottles, removing labels and dreaming of his project. In the spring of 1980, at the age of 66, he began construction of his pet project, not quite sure where it was going to take him. As his six-gabled structure was taking form, visitors started coming in. Impressed by his work, they encouraged him to continue and to advertise it as a tourist attraction. And so, in 1981, the first Bottle House was open to the public. From 1980 to the spring of 1984, he cleverly cemented over 25,000 bottles of various shapes, sizes and colours, into three fantasy-like buildings. 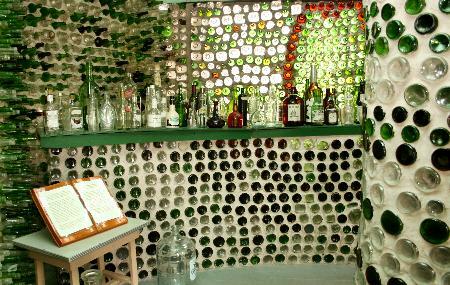 The first bottle house was built in 1980 out of approximately 12,000 bottles, measuring 20 feet x 14 feet with three main sections. Its six gables and the patterns produced by the careful choosing of colours and sizes of bottles truly makes this a unique building. Mr. Arsenault would cement between 300 and 400 bottles per row, using a total of approximately 85 bags of cement over a six month period. 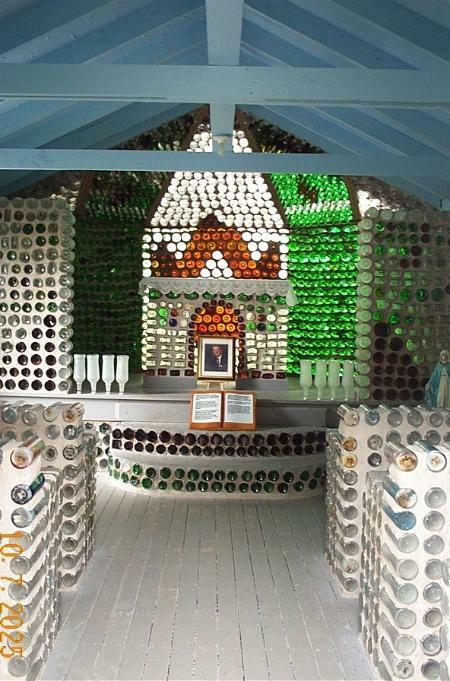 In 1982, Édouard decided to try his luck at a second building, using approximately 8,000 bottles this time. This tavern-like hexagonal structure was originally used to house the attraction's souvenirs and handcrafted items made by his wife Rosina. 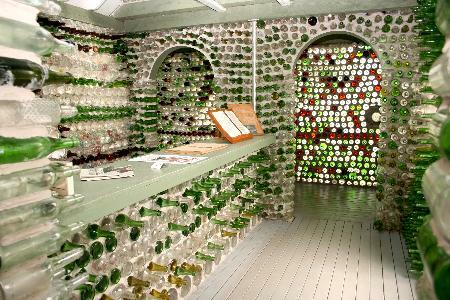 Today the tavern houses a large selection of interesting bottles collected by Edouard. Whenever he came across a bottle that had a special feature, he preferred to keep it for display rather than using it in the construction. The third building constructed by the late Édouard Arsenault is truly a work of art. 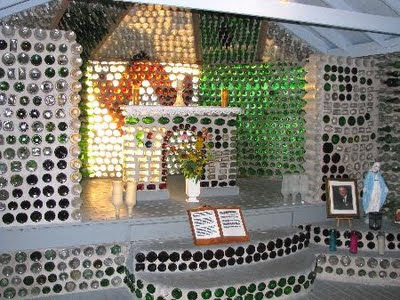 Approximately 10,000 bottles were transformed in 1983 to become a magnificent little chapel, complete with pews and altar. At the time of his sudden death at the age of 70, in the spring of 1984, Mr. Arsenault still had a bit of work to do, he intended to make the steeples higher and the front pew was not quite completed. At sunset, a symphony of light and colours streams in from behind the altar. Unfortunately, Prince Edward Island’s winters are not very gentle. The railway ties used as foundations did not withstand the effects of the bad winter frosts. Over the years, the buildings deteriorated to the point that they had to be rebuilt. 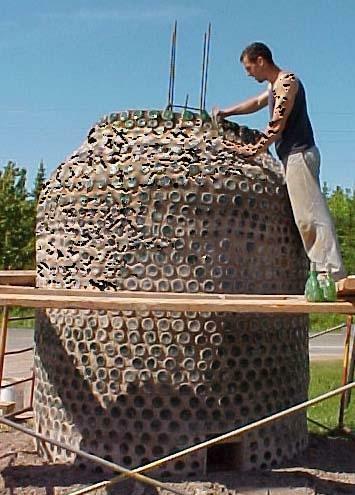 Between 1992 to 1998, the original buildings were photographed from all angles, carefully measured and then brought down by hand, recovering the glass bottles from the mortar. Four foot foundations were then laid before local bricklayers carefully reconstructed the buildings, using the same bottles as in the original structures and following the same basic designs. The roof and the central cylinder of the second building are the only components that were maintained in their original form. 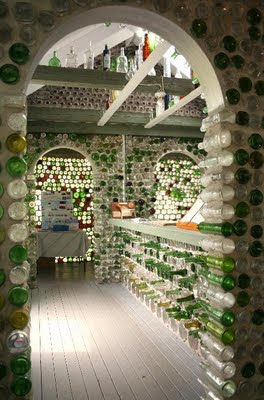 Altogether over 25 000 recycled bottles were ingeniously cemented together to create the Bottle Houses. The houses are nestled in a number of mature gardens originally created by Édouard. 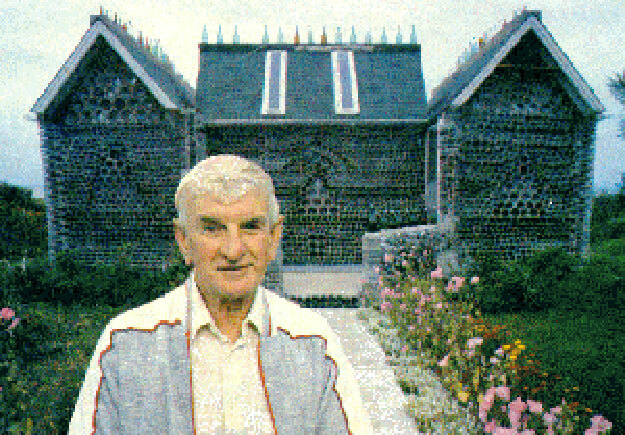 He built the stonework and developed the flower gardens surrounding the buildings at the beginning of his retirement years in 1974. The stones were picked locally by him and put together to create a peaceful setting for the gardens surrounding the houses that were to be built later. 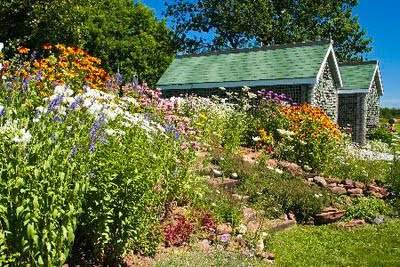 A keen gardener, he also planted all the trees on the property and enjoyed growing a wide variety of perennials and annuals. The present owner, his daughter Réjeanne, also enjoys this task from year to year, with the help of her son Étienne Gallant who also designed and built a large bottle near the road. This new thirteen feet high structure required 2,000 bottles. I love bottle houses. Visited many. I'm always surprised they're located almost everywhere. There's a famous (beautiful) one in Taos, New Mexico . . . that picks up different light during different parts of the day. Magical. There are some great ones, deep in the Ozarks of Missouri -- that are almost "secrets." 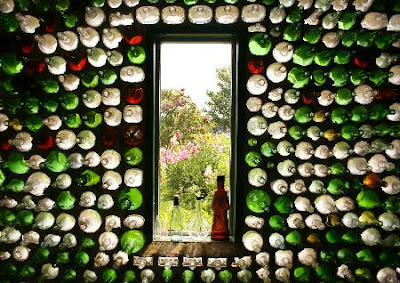 For many years now, I've actually thought of doing a photo book of beautiful bottles houses. Maybe some day . . . 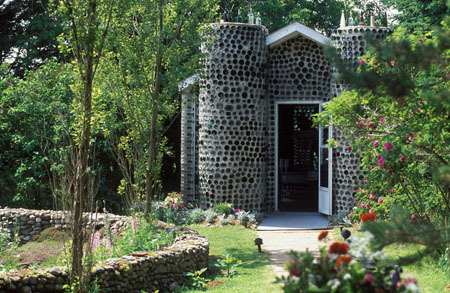 I find these bottle buildings fascinating. Would like to do a little feature wall or something in the garden. Beautiful photos. That beautiful building with bottles, I love many other things for its bright sunshine and beautiful designs. I like the bottles, is one element I used a lot in my work, but almost always broken. I wish you a happy summer. 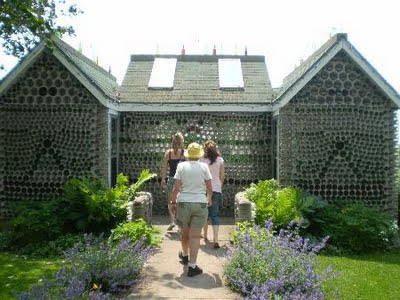 I love the look of the bottle houses. I once saw a building plan where the tops were cut off and the bottoms butted together for similar look on inside and out. It all looks like a lot of stock piling - or many friends contributing. 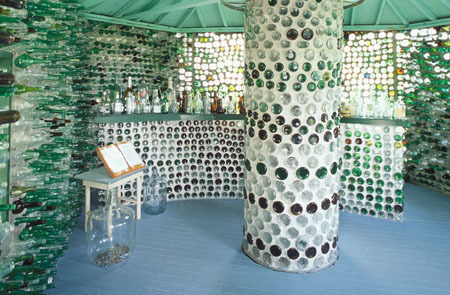 Amazing bottle houses. Trying to imagine how it is when sunlight filters in through those multicolored bottles. Must be spectacular. Very unique addition to a landscape design if one desires something avant garde. Oddly, until reading this post I wasn't aware there had been a bottle house on Vancouver Island. Just did a bit of Googling and found that I'm too late to see it, it fell into disrepair, was bought by the Ministry of Highways and demolished not that long ago. Love the light coming through the bottles in that first photo. Beautiful. Thats too bad about the Vancouver Island house being demolished Helen, guess you will just have to build your own one! West Point and Miminegash honors the islanders' connection to the sea. Visitors can explore a lighthouse or go down to the wharf for fresh seafood. With its spectacular scenery, this part of the coast is a popular tourist destination.